Short Menu sits in your menu bar, waiting for you to shorten an URL. It supports 17 different services and is extremely easy to use. Simply click on Short Menu's menu bar icon to open it. It automatically takes the URL from your clipboard. 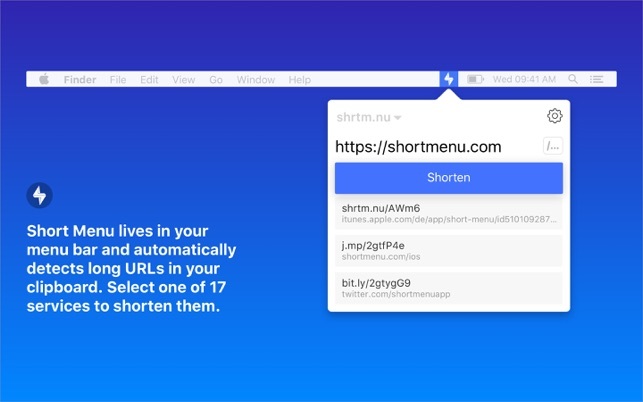 You only have to press one button, then Short Menu will shorten your URL and automatically copy the short URL for you. 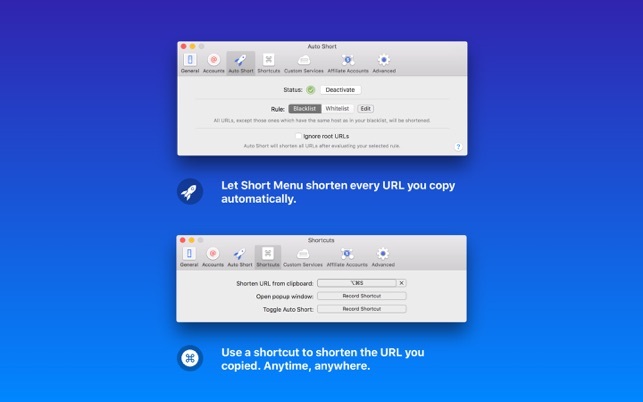 After shortening, Short Menu saves both the short and long URL in your history, which will be synced with iCloud to ensure you got all your short URLs on all your devices (if you're using the iOS version of Short Menu, even on your iPhone and iPad). If you consider yourself a keyboard ninja, you probably don't touch your mouse too often. Short Menu got you covered! Simply configure a system-wide keyboard shortcut using the Quick Short preferences. When pressing your shortcut, Short Menu will take the URL from your clipboard, shorten it and automatically copy the short URL for you. 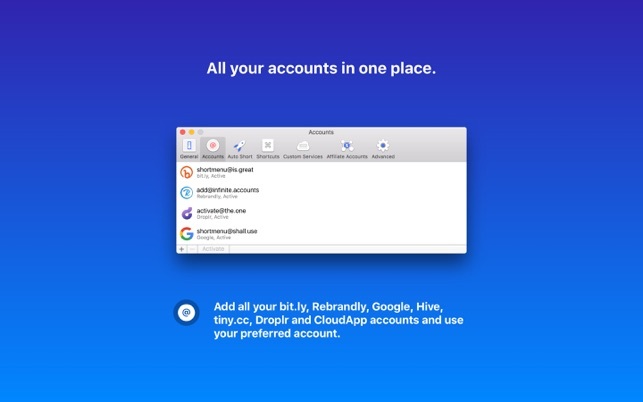 Short Menu perfectly integrates with bit.ly, Rebrandly, Google, Hive, tiny.cc, Droplr and CloudApp (for using Rebrandly, tiny.cc, Droplr or CloudApp, an account is obligatory). 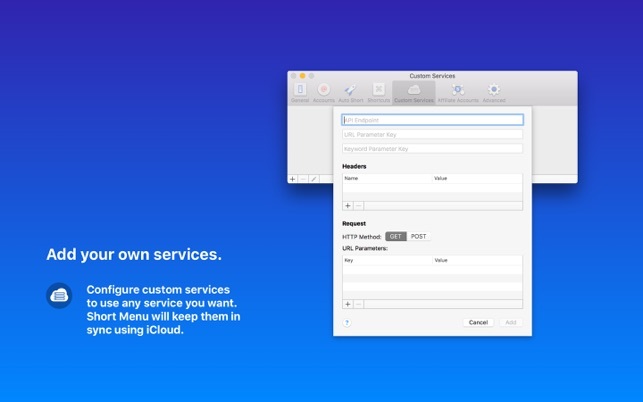 You can easily manage all your accounts in Short Menu's preferences and, if you added multiple accounts for the same service, activate the account Short Menu shall use. This update fixes an issue where the menu bar icon of Short Menu was invisible on macOS Mojave. Shortening long URLs always looks more professional than sending long long long URLs, no matter what the format. I’ve been using this application for years, and the developers have constantly stayed ahead of the curve to make sure it works everywhere and in all circumstances. This version was a major improvement to make sure just that happens - that they stay ahead of the curve. They’ve done just that - stayed ahead of the curve. Get this app - it does everything it claims to do, and does it simply and well. I just happened upon this app this morning… and already, I love it! I love that it automatically grabs the current URL in the clipboard when you need to shorten a link, and then puts the shortened link back into the clipboard. It couldn't be easier to use (except maybe if there was a hotkey which would also kick-off the URL-shortening process). 5 stars for sure! Apps like this are what makes Macs great. 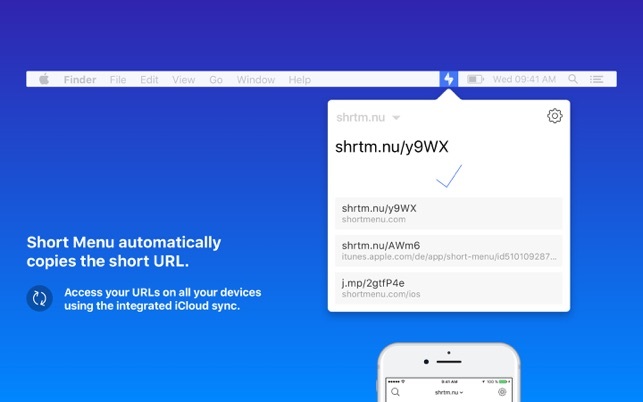 I just came across the need to auto shorten URL’s, specifically those horrendously long Dropbox share URL’s and found this app. It’s amazing and makes all your copied URL’s nice and short on the fly. Simple and powerful and very well designed and developed. There’s tons of options to customize your shortnening services and how the app functions but it works sweet out of the box too!